In January, I posted the story of an African American artist named Richard Lonsdale Brown (1892-1917). Recently I came across new information that inspired me to revisit his life. Raised in West Virginia, he traveled to New York City where his talent was recognized. He was featured in the New York Times. As was often the case for young fine artists, supporters hoped he’d continue his artistic studies in Paris. The trip would never take place. Brown died at the age of 26. Few of his watercolor or oil paintings survive today but he may have left an unexpected legacy in the impact he made upon W. E. B. Du Bois. Brown found the artist’s studio and knocked at his door. Brush answered. He listened and then he reviewed the modest portfolio. An internationally renowned artist, Brush recognized the young man’s talent and invited him to study for a summer in Keene, New Hampshire. Afterward he studied at the American Academy of Design. Through Brush, Brown’s work would catch the attention of the founders of the newly formed National Association for Colored People (NAACP), including W. E. B. Du Bois and Mary Ovington. He became their protege. On January 1912, his artwork was exhibited during the first annual meeting of the NAACP, and would be exhibited during future annual meetings as well. In March, with Ovington’s aid, his work was exhibited in a NYC gallery. The press was spectacular. The turnout was great. Brown’s works were purchased by collectors from around the world. Later in the year, his artwork would grace at least two covers of The Crisis, the national magazine published by the NAACP. In 1913, he would turn his attention from painting landscapes to design and decoration as he worked with Du Bois to execute The Star of Egypt. In 1911, Du Bois had written The Star of Egypt, a historical pageant presenting the history of African Americans over time. Brown would serve as set decorator, along with Lenwood Morris. He would travel with Du Bois as they met with both blacks and whites in an effort to raise funds. An elaborate production involving casts of thousands, it was well-received though struggled with financing. The pageant would be staged in three cities during Brown’s life, New York in 1913, Washington, DC in 1915, and Philadelphia in 1916. His time in the northeast studying art, his work with W. E. B. Du Bois, the changing landscape of America and a world that was on the brink of war, all of these things were influencing Brown’s artistic aspirations. In a 1913 interview about his art, he tentatively but determinedly brings up the question of race. That trip South she refers to would take Richard Brown to his parent’s home in Muskogee, Oklahoma. The year was 1917. On his World War I draft registration card, completed in Muskogee in June, he notes his occupation as artist and his race as African. He died of pneumonia in September of that year. While it is unclear why Brown returned to his parents, it is clear from subsequent editorials by W. E. B. Du Bois in The Crisis that Brown, like many black artists in that time, was not making a living as an artist. Always a proponent for nurturing art within the black community, Du Bois took pride in showcasing the talent of young artists like Richard Brown. As he refers to Brown in editorials over the next few years it is with an underlying note of frustration if not outright anger at the loss of this young man’s talent from the world. Those feelings are directed at the white community and at the black community for not financially supporting the creativity within its midst. In 1928, Mary Brown, Richard Brown’s mother, wrote to Du Bois. She had a dozen of his paintings and sought his aid in selling them in New York. With the money raised she hoped to create a monument for her son. They were all unframed, she said, and encouraged him to deduct the expense of framing from the sell of the paintings and also to deduct a stipend for his time. He took on the task but was unsuccessful. Even with the aid of Mary Beattie Brady of The Harmon Foundation, he could find no one willing to spend more than few dollars per painting. Brady and he agreed that they should not be sold for so little. 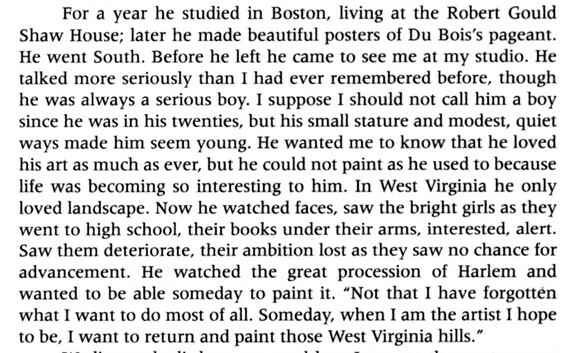 In the last letter between Du Bois and Brown’s mother, dated April 1931, Du Bois expresses his regrets and asks if she’d like him to return the paintings or to hold on to them in hopes that the New York scene might improve. Today Brown’s paintings sell for thousands of dollars.